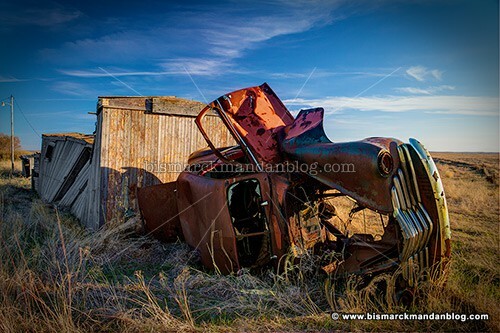 I’ve alluded recently on social media that I was working on a little rig to help me with the type of photography I do. Case in point: the photo above. The sun was setting to the right of this photo, leaving the rest of the car in the dark. I wanted to fill with light rather than try to Photoshop it later, but that takes a lot of light. After trudging back to the van twice for more lights and stands, I figured there had to be a better way to get multiple flash units in one place. That was the inspiration for Frankenrig. I’ll admit: it doesn’t look like much. It’s more an assembly of parts bought online with only one piece of my own handiwork. I messed with different lengths of 1/4″ thick aluminum until I found the right one, cut it, drilled it, tapped threads into it, and attached the various things I needed in order to hang three flashes from one lightweight portable stand. Once I found the right length, it was off to the powder coater to get a durable finish applied. To each of those pegs I attached a pivoting light bracket. 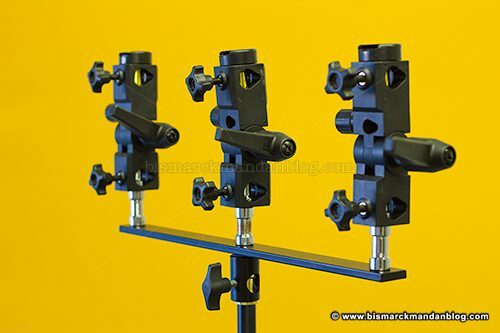 Each bracket can swivel on its post, while each bracket can articulate back and forth. Why use such tall pegs, you ask? Because I want to be able to operate the knurled knobs on the bottom of the pivoting brackets, even with winter gloves on, so I need the clearance. In each pivoting bracket I attached a cold shoe so I could easily slide a Speedlite on and off. 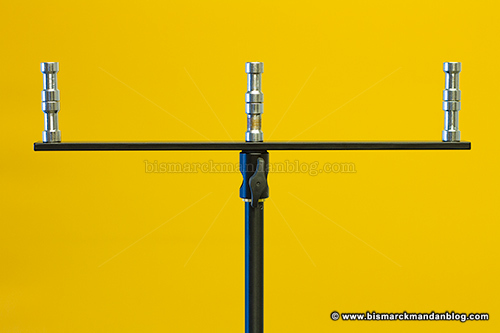 I have spare pegs in case I want to use a studio strobe, but that’s not why I built Frankenrig. 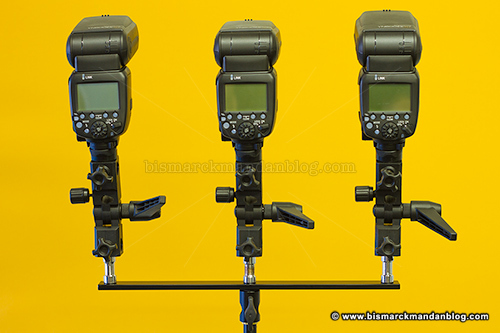 Here are the three radio controlled Speedlites attached. I tried different lengths of aluminum because I wanted Frankenrig to be as compact as possible, yet allow enough room between brackets to allow manipulation with winter gloves on. It’s a very flexible rig. The posts allow a number of things to be hung on this bracket in a variety of ways. 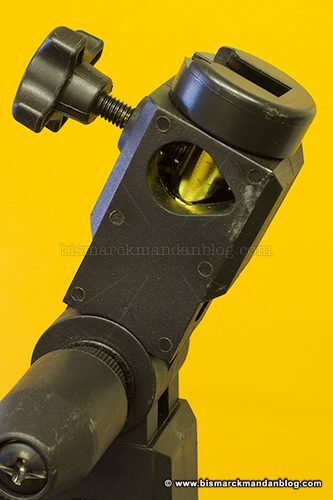 Each flash, in addition to its own pivoting head, can pivot by rotating the cold shoe’s peg in its bracket. The bracket can pivot using its hinge, and it can swivel on its peg. The 1/4″ x 1″ aluminum isn’t going to bend and everything is clinging together with 3/8″ threads and Loctite, so it’ll handle anything I opt to hang on it. 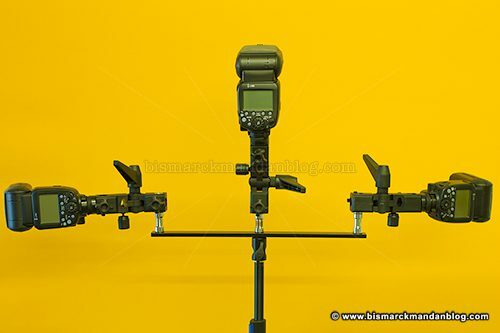 So here I have a compact little rig which attaches to any universal light stand, including the lightweight ones I use for my type of photo trips. It’s a simple device, but allows me to bring a lot of light to a location with very little work. It’s a pretty specific tool, though; it’s most suitable for my type of photo trip. I want something lightweight and portable, not studio strobes. I need to be able to set up in uneven terrain, so the stands I have do that. I need to be able to adjust it, even in the cold with thick gloves on. And I want it to be overbuilt in the strength department, because that’s how my dad taught me. I look forward to taking Frankenrig into the field and throwing a lot of light at something! Then I can sing its praises when I have cool, well-lit photos to share here.